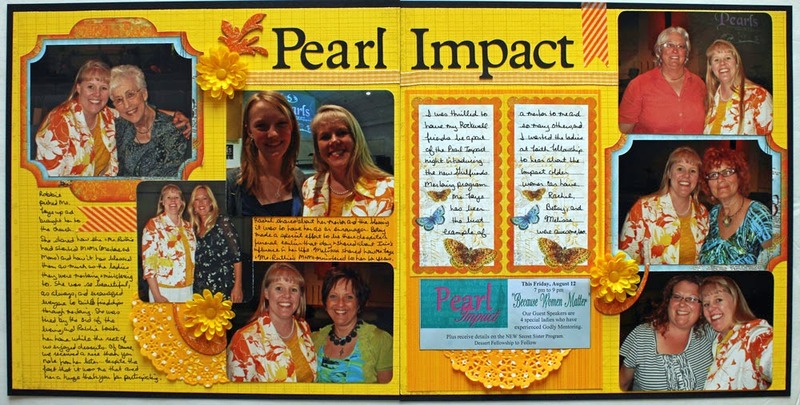 I have a few more layouts to share today as I continue my goal of completing our 2011 chronological albums. 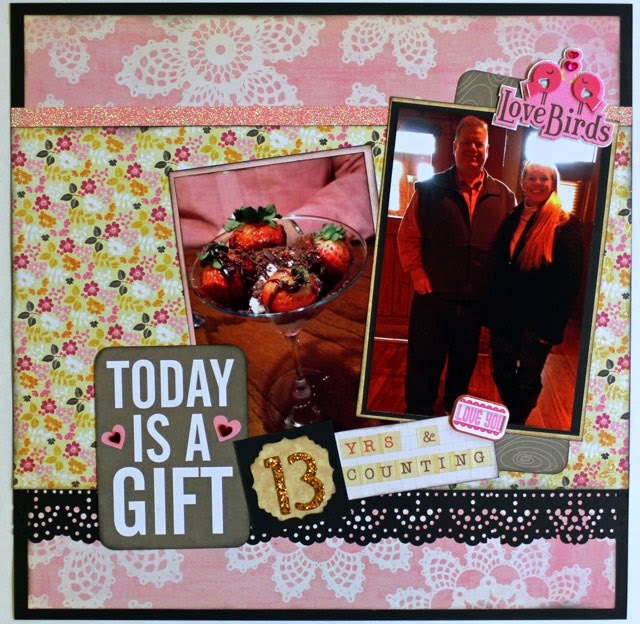 The INSPIRATION for this first layout came from a sample layout in the old BPC 2011 Creative Crop. 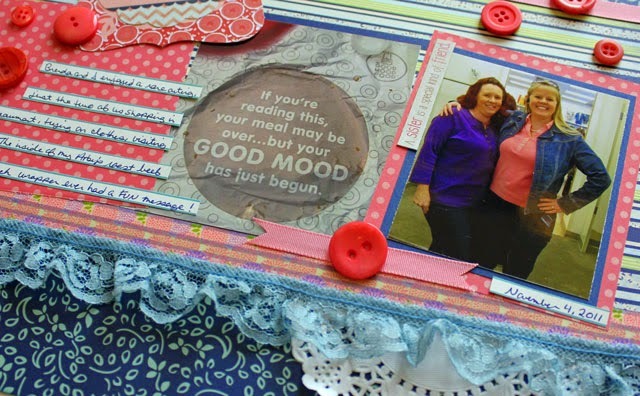 I especially like the look of the lace border and the button embellishments on this FUN page. 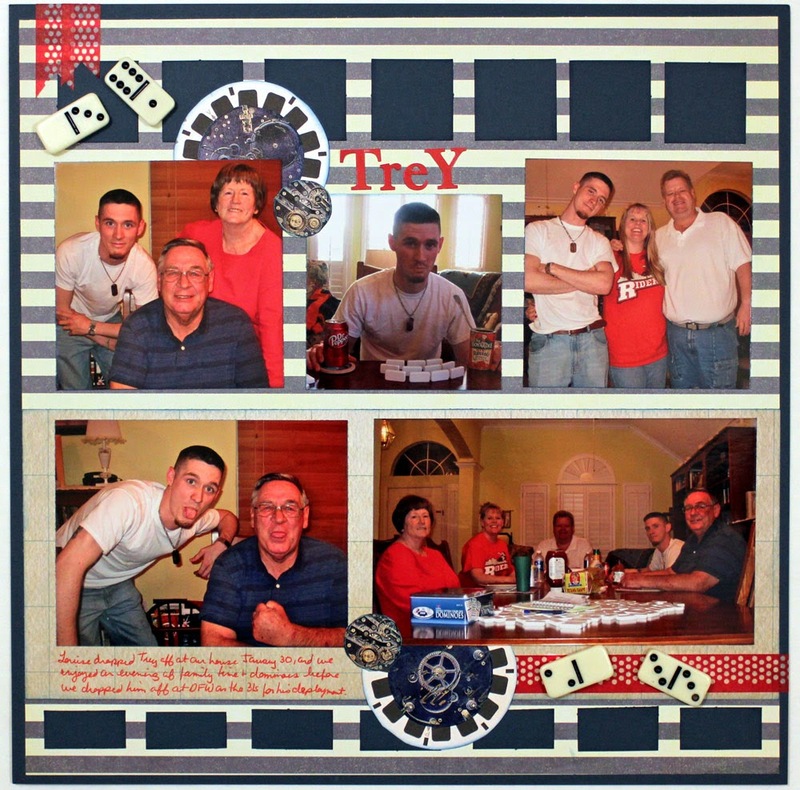 This second layout is a simple design showcasing photos of a visit from my cousins from out of state. 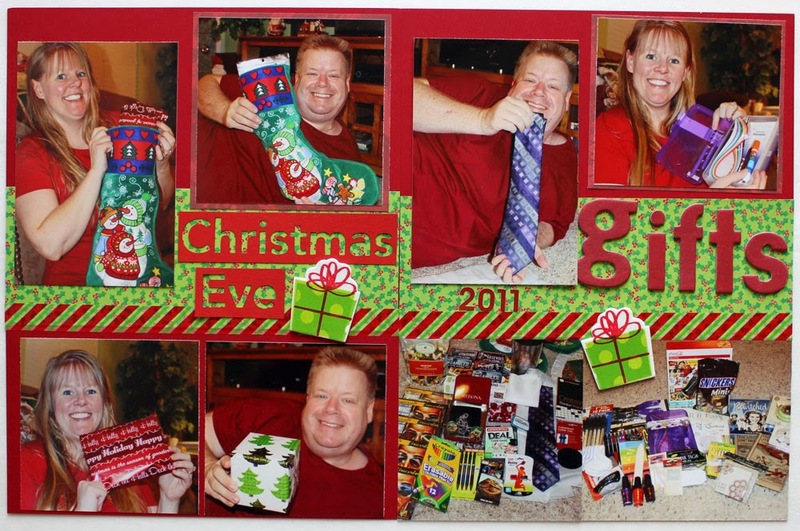 I created two 8 1/2 x 11 pages to showcase photos from Christmas Eve. These pages will go back to back in an 8 1/2 x 11 page protector, which will go in the 12x12 album as I enjoy mixing page sizes and styles within each album. As usual, I am scrapping as INSPIRATION strikes rather than in chronological order, so these Christmas photos are not an indication that I'm nearing the end of the list of photos and stories that I want to add to our 2011 albums. However, they do signify that I'm making progress and checking items off that list! 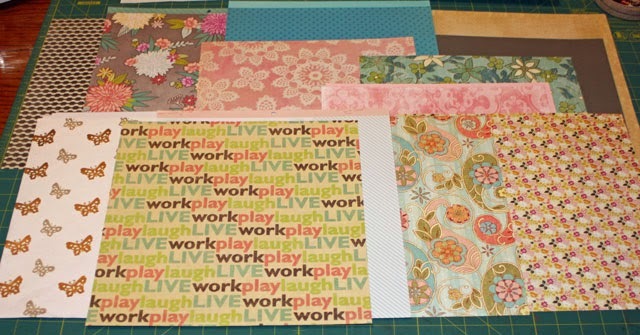 When my friend Amy came to visit back in January, she brought me a page kit from Lickety Split Scrapbooks. The colors in the kit worked perfect with a photo I had from several years ago that allowed me to tell the story of hosting a book club here at our home. 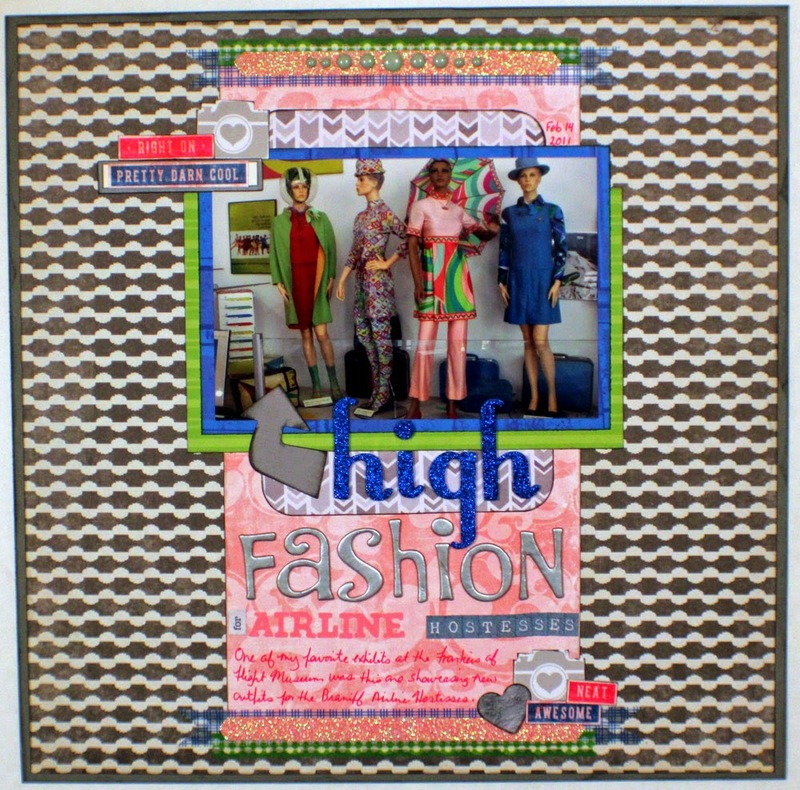 Do you follow the directions that come with page kits . . . or veer off in your own direction? As part of my year of INSPIRATION, each month I am challenging myself to scrap my Top Five (photos or stories or events) from the previous month. 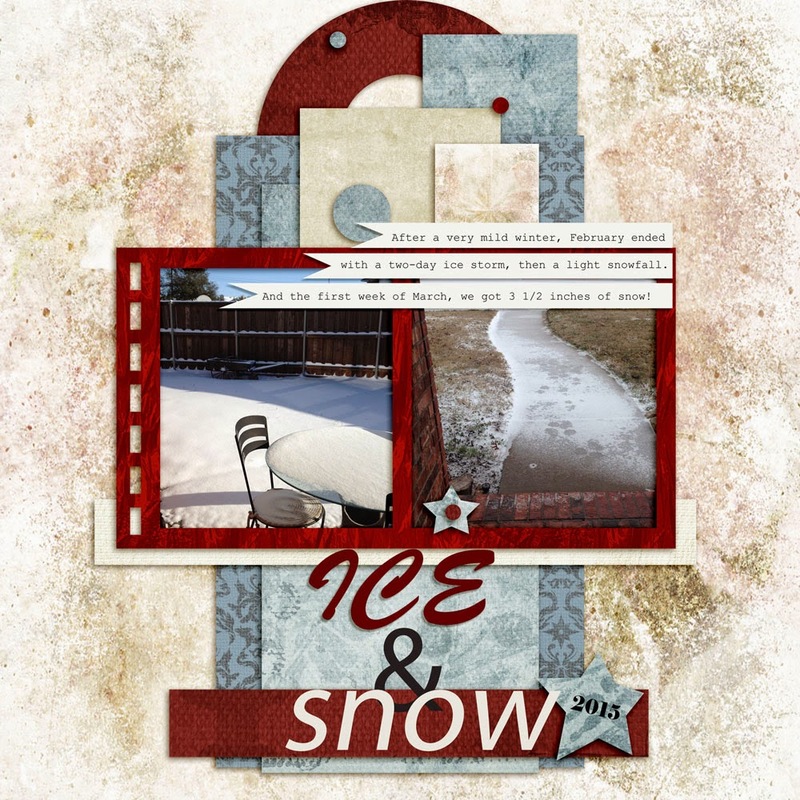 Since I created an 8x8 layout for my story about the ice and snow we had at the end of February, I decided to use that same size for the final of my February Top Five layouts. 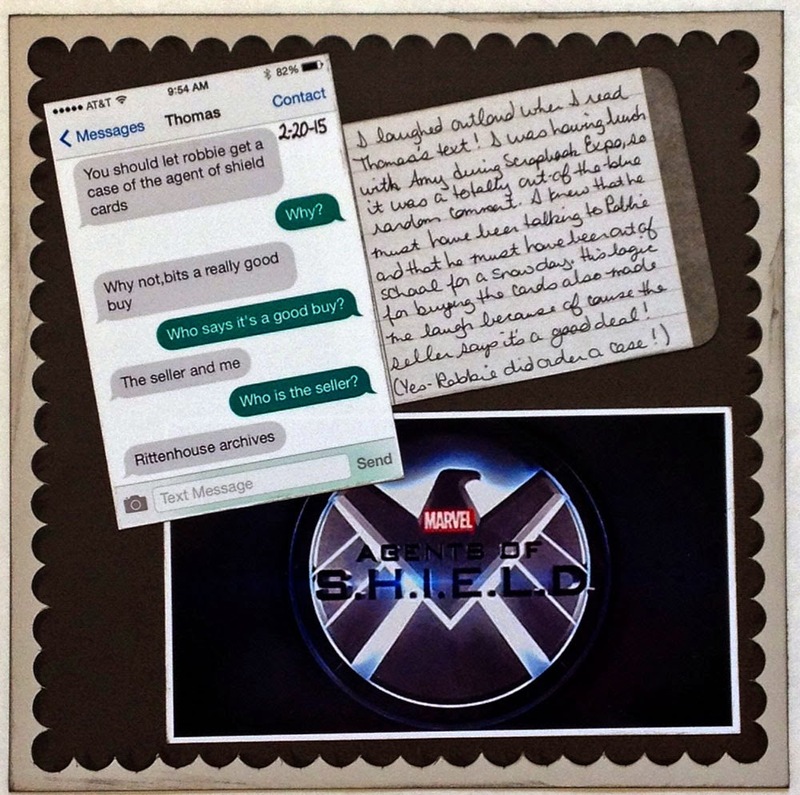 This simple layout showcases a snapshot of the text I received from our nephew along with a 3x4 journaling card and an Agents of SHIELD logo I printed from the Internet. Since February ended with a bout of wintry weather here in Texas, I chose that as one of my top five. 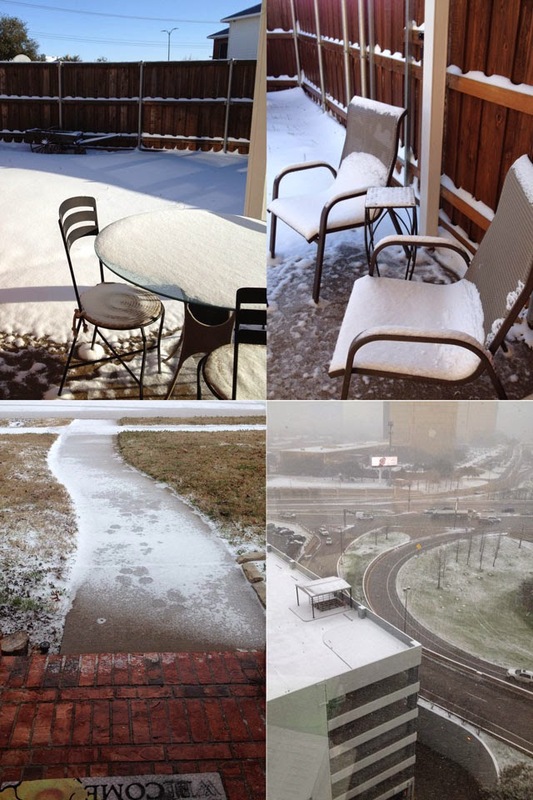 I'm not much for getting out in the cold weather, so I only had a few photos that I'd snapped from the doorway. 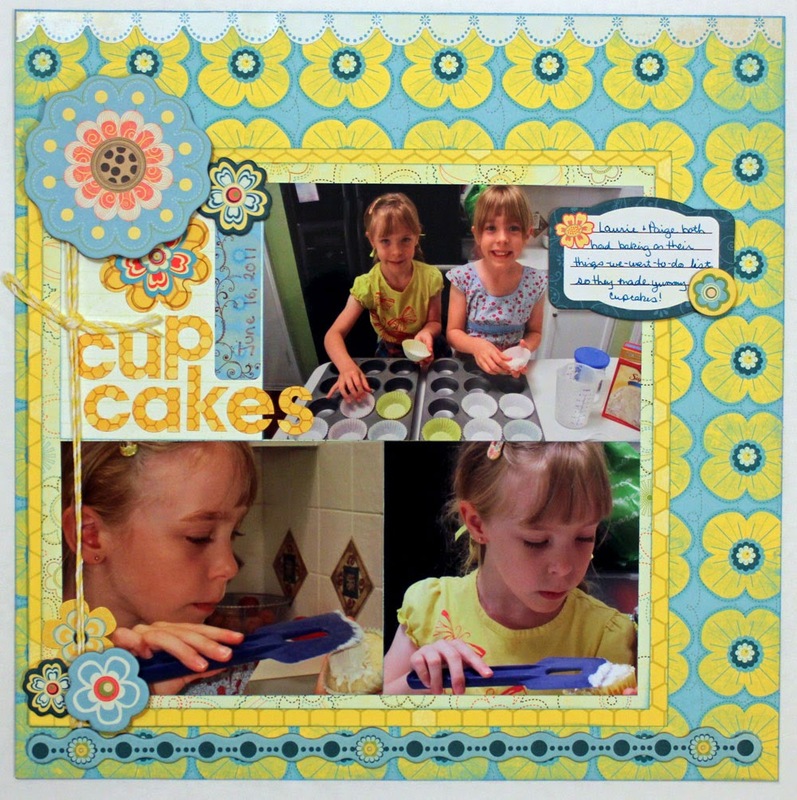 I decided to create an 8x8 digital layout using Template #100 from Get It Scrapped, which caught my eye as I was browsing blog land last week. I used some digital papers from my stash and ended up with this layout. I printed this 8x8 page at home and decided to add a little extra to it before putting it in our 2015 album. I chalked the edges and adhered some glittery snowflakes. 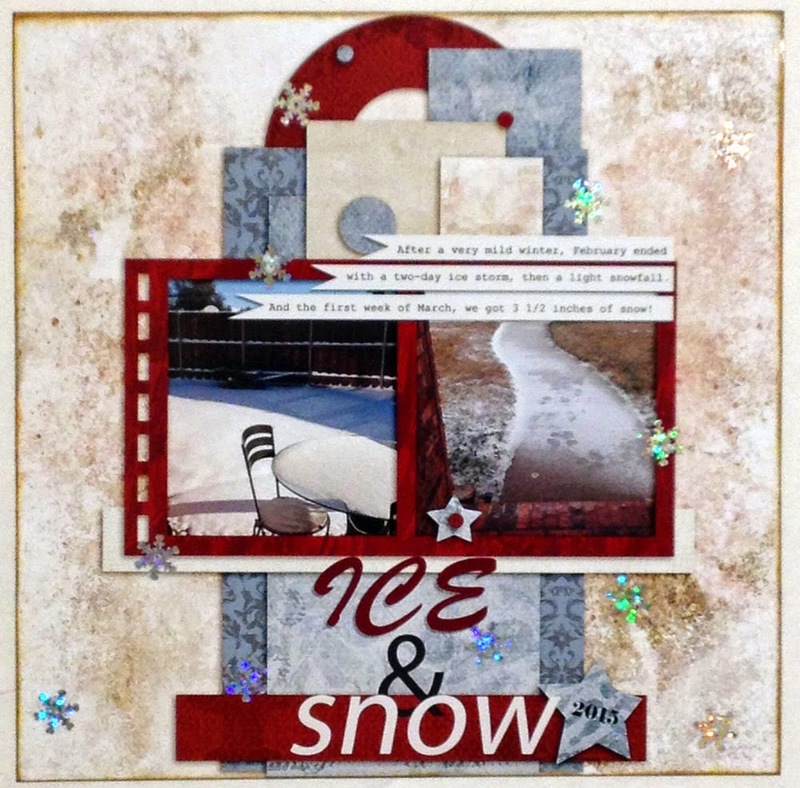 I like how the snowflakes add glitter and dimension to the layout while the chalked edges add a nice border to the page. Do you add traditional elements to your digital layouts? Mama came out to scrap with me for a couple of days in early February. 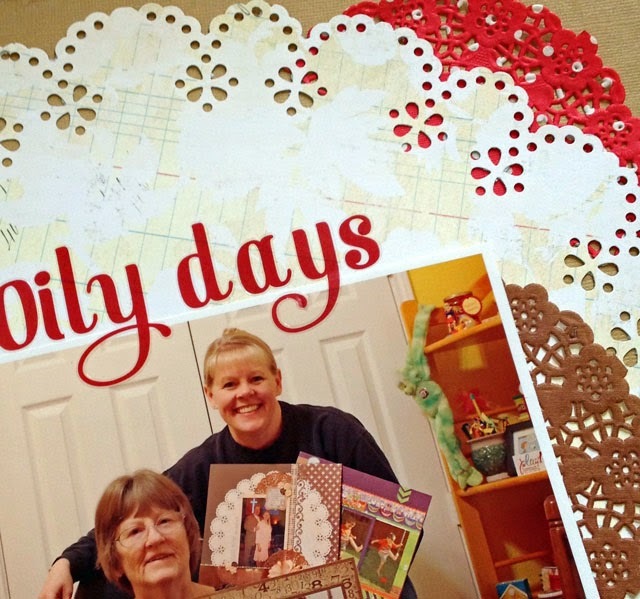 As y'all know, I've been enjoying using doilies on cards and layouts lately, so I mentioned to Mama that we should use a doily on all our layouts because it's FUN . . . and I have amassed quite a stash recently. 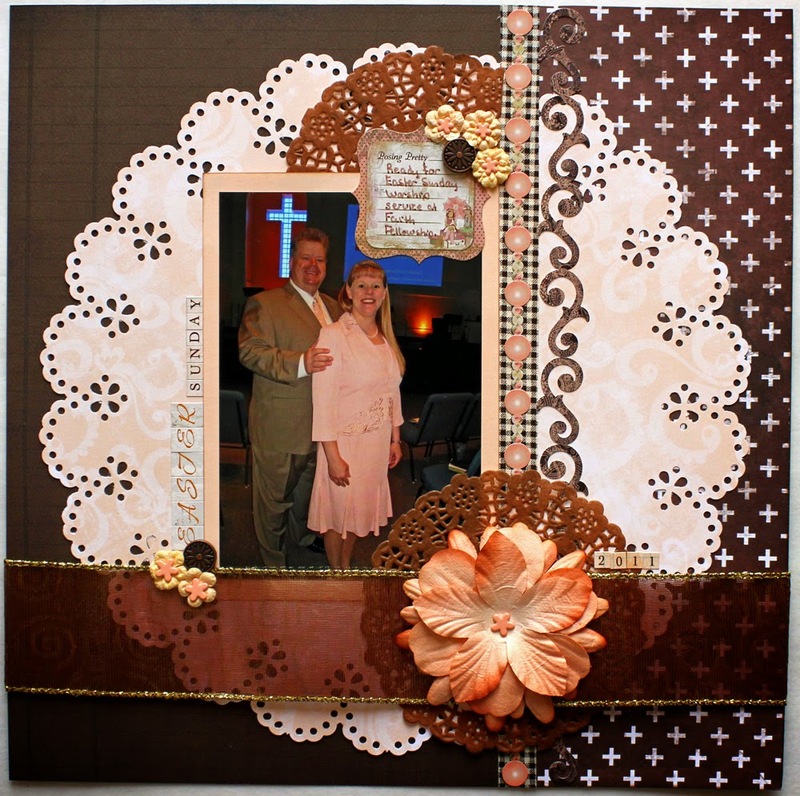 We had a great time creating a bunch of layouts and used a doily on almost every one! So, of course, I had to use several doilies on the layout about our crop together, which we started calling "doily days." I printed a filmstrip of photos showcasing some of our layouts along with a photo of me & Mama in my craft room. The problem with these doilies is that there are 75 in a package. That's a lot of doily in one color, but I've found that sharing them is a fantastic way to keep the stash in check . . . and reserve room to add more colors! 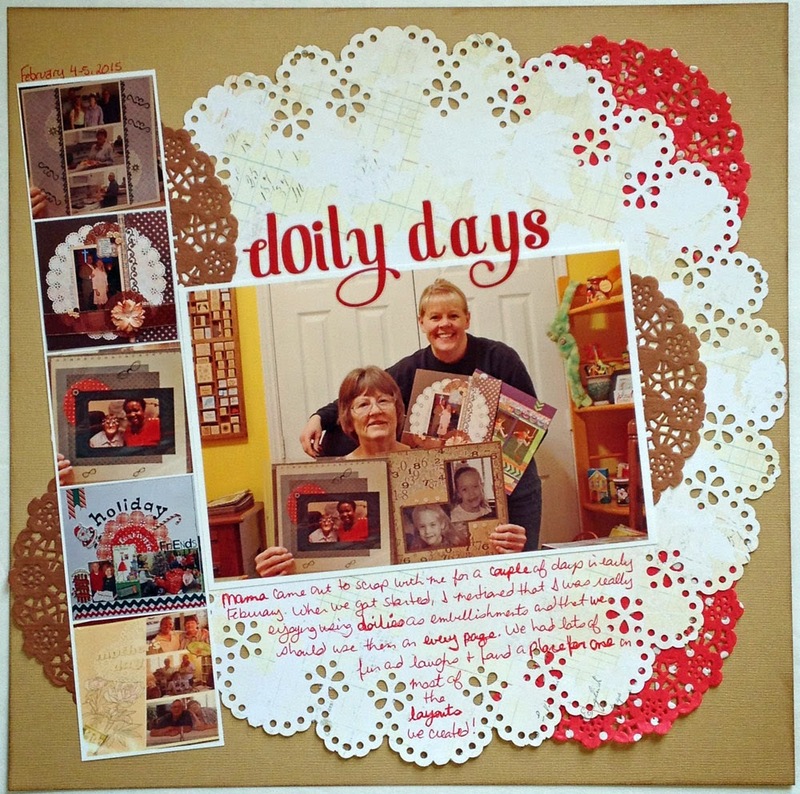 Have you used any doilies lately? If you could only choose one, which color doily would you pick for your crafting? 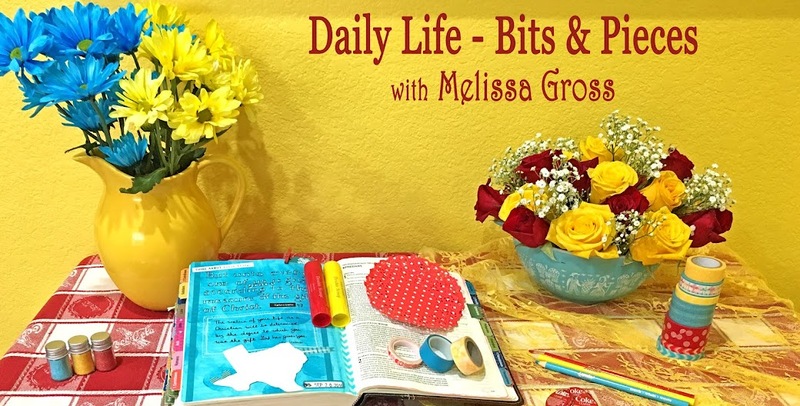 I'm sharing about my upcoming class over on the Scrappin' Goodtime blog today. 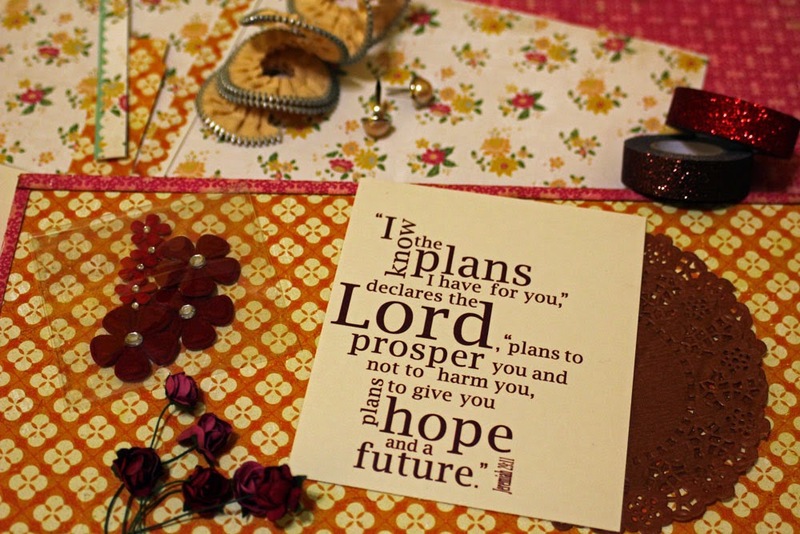 Here's a look at the scripture word art I created for the 12" x 8" canvases we'll create during the class on April 10. Check out all the details about this 2-hour class merging art and faith HERE! As I'm working my way through my 2011 photos, I'm enjoying creating two page layouts for those stories and events that require more than one page. 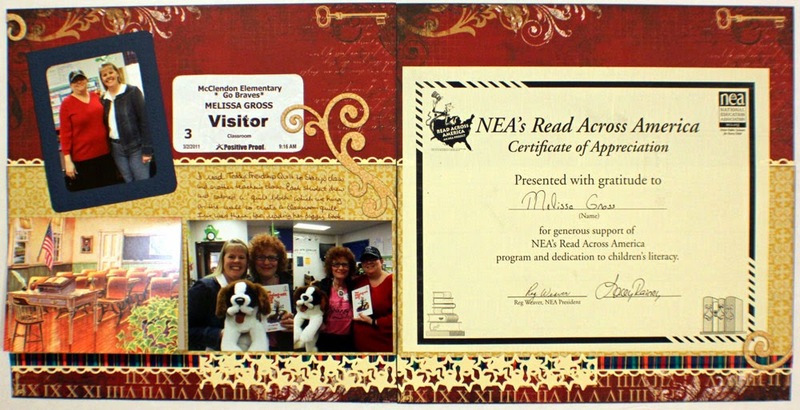 For my Read Across America layout, I knew I wanted to include the Certificate of Appreciation I received, so I included it on one page and my photos, visitor name tag and journaling on the other. 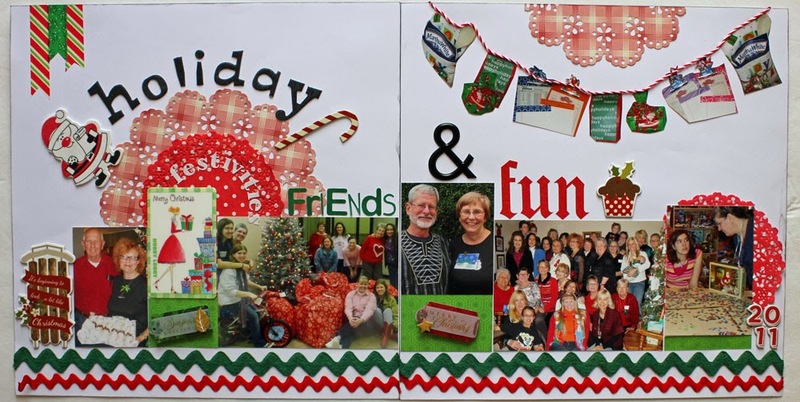 My Holiday Festivities, Friends & Fun layout showcases photos and memorabilia from throughout the month of December and was inspired by a layout in the old BPC 2011 Creative Crop workshop. I really like how the strong border across the bottom pulls all these miscellaneous photos together. 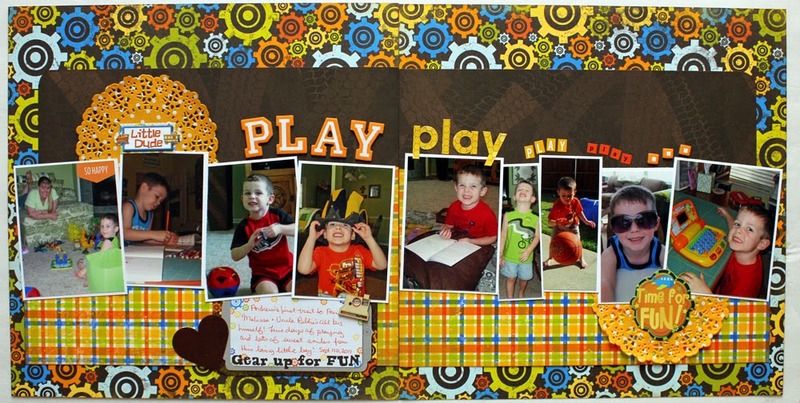 This Play, Play, Play layout was also inspired by a sample layout in the old BPC 2011 Creative Crop workshop and records the variety of FUN we had when our great-nephew was here for a week long visit. 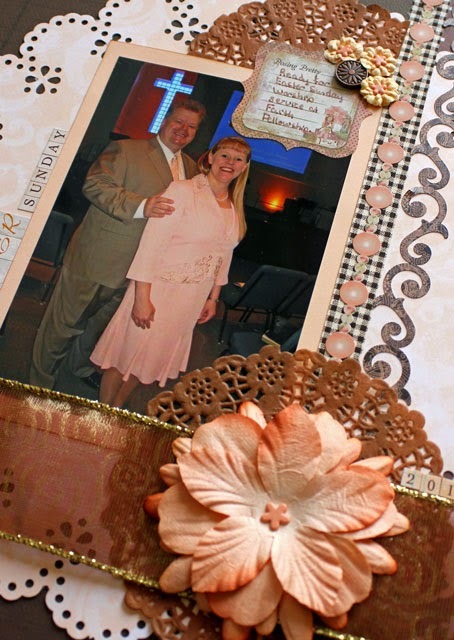 This final layout for today holds lots of photos and several blocks of journaling about a ladies' event at our church. 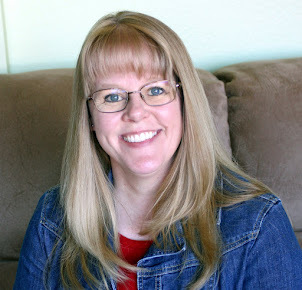 Several of my good friends came from out of town to help me out as guest speakers for this event on women mentoring women, and I needed quite a bit of room for journaling along with the photos and event information block I'd cut from the church bulletin. As you can see, I'm making progress on our 2011 chronological albums. I'll definitely be working on more two page layouts as I continue. 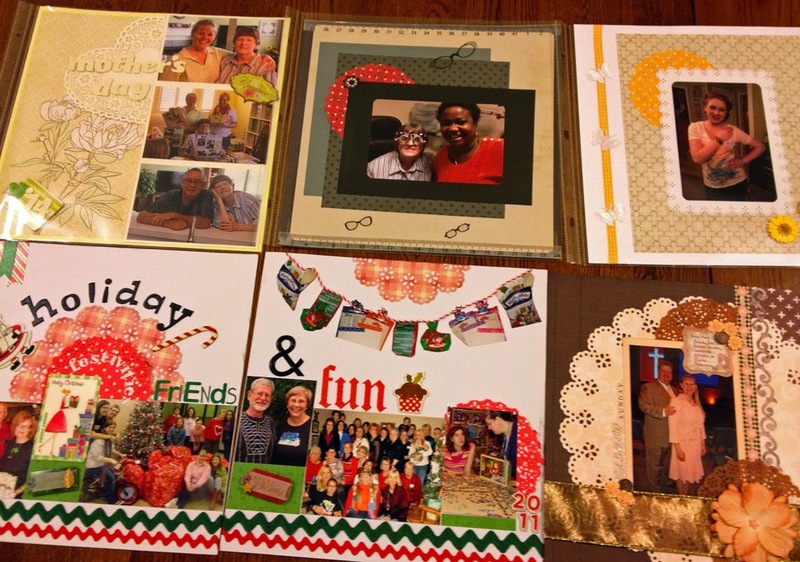 Do you create two page layouts? Or do you prefer to capture each story on one single page? As part of my year of INSPIRATION, each month I am challenging myself to scrap my Top Five (photos or stories or events) from the previous month. 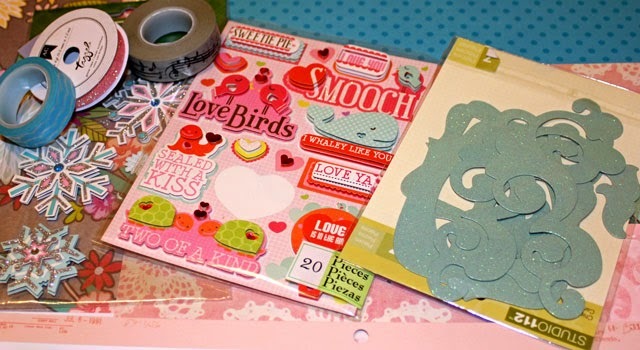 I knew I wanted to include the postcards I received from Sian's Pile of Postcard Valentine Exchange in our 2015 album because it was definitely a FUN part of February this year! 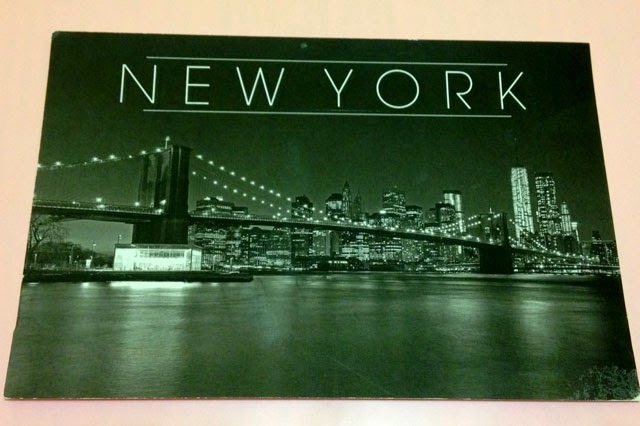 I received my sixth and final postcard I from Maya near the end of February - a beautiful skyline view of New York. Thanks Maya!! 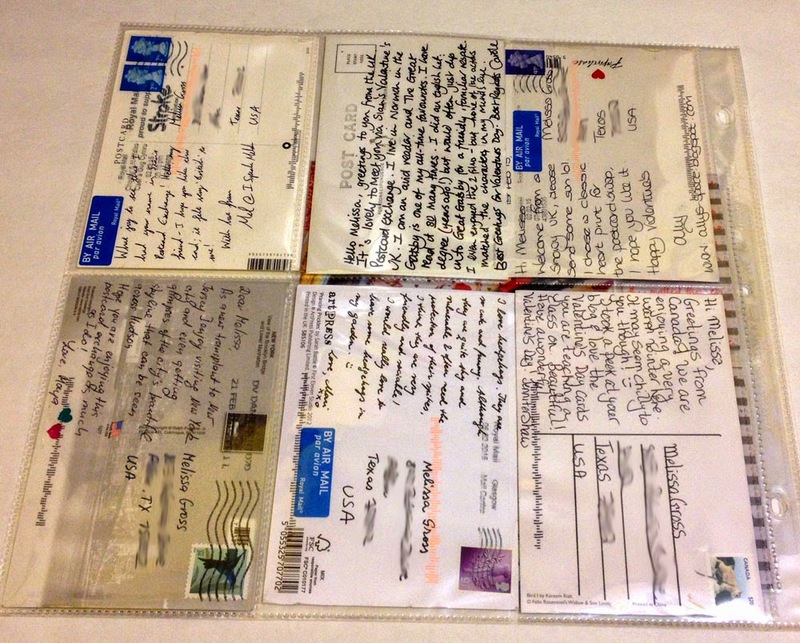 So, I had six postcards from the exchange, which would all fit nicely in a 12x12 divided page protector. However, I also wanted to include the postcard that I received from Rinda and used as INSPIRATION for creating my own postcard to send as part of the swap. I decided to include a copy of my postcard as well as the logo from Sian's blog, too. I chose an 8x8 divided page protector from my stash and stitched it to the 12x12 page using my sewing machine. Here's a look at the two pages together. Having the two page protectors stitched together makes it easy to see that all these cards and my journaling go together, and the 8x8 page flips open easily. I also really like being able to read the lovely handwritten notes on the back of each postcard. 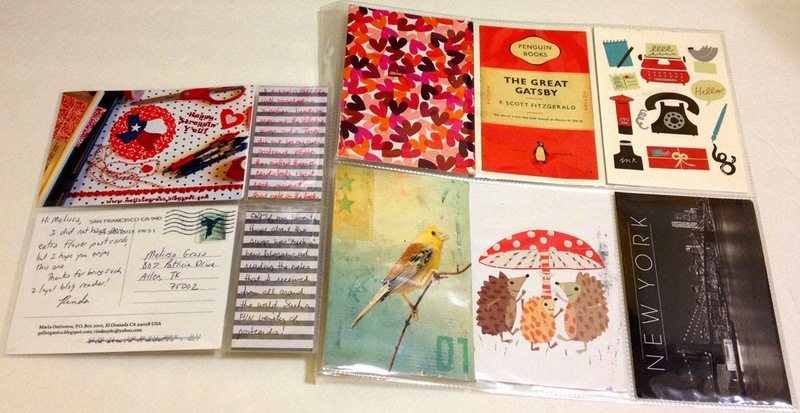 Did you participate in the postcard exchange? 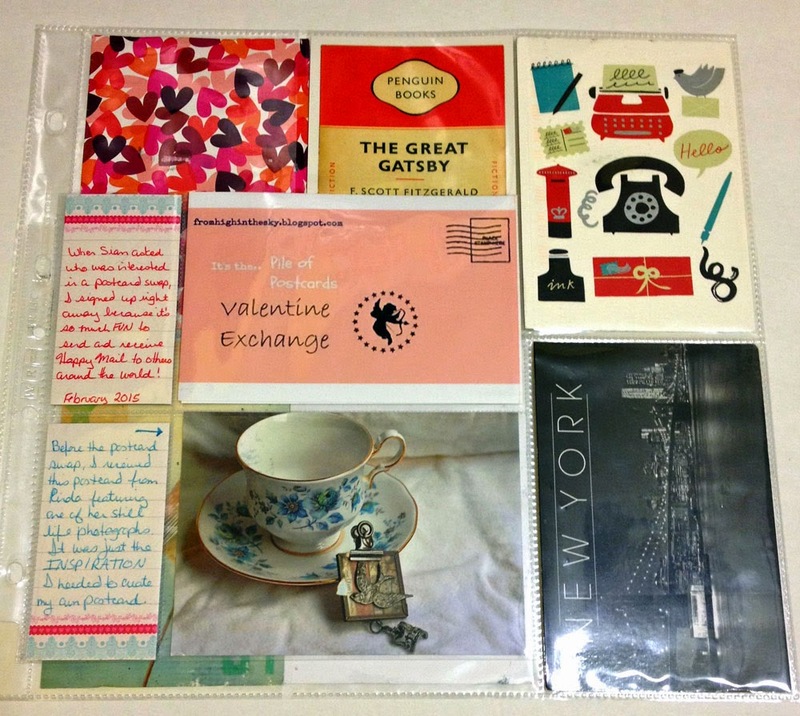 How would you include the postcards in a scrapbook? 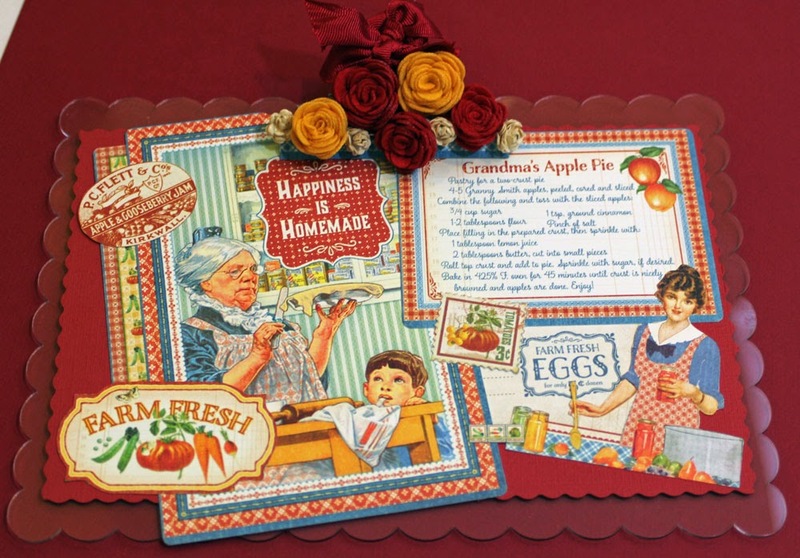 I have a new post up on the Scrappin' Goodtime blog today sharing an altered clipboard using a Clear Scraps scalloped clipboard, Graphic 45's Home Sweet Home ephemera cards, and Queen & Co's new rolled roses. 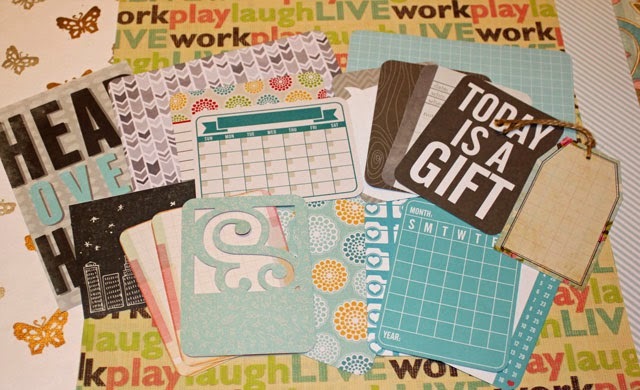 Click HERE to read more about this clipboard on the Scrappin' Goodtime blog. 1. 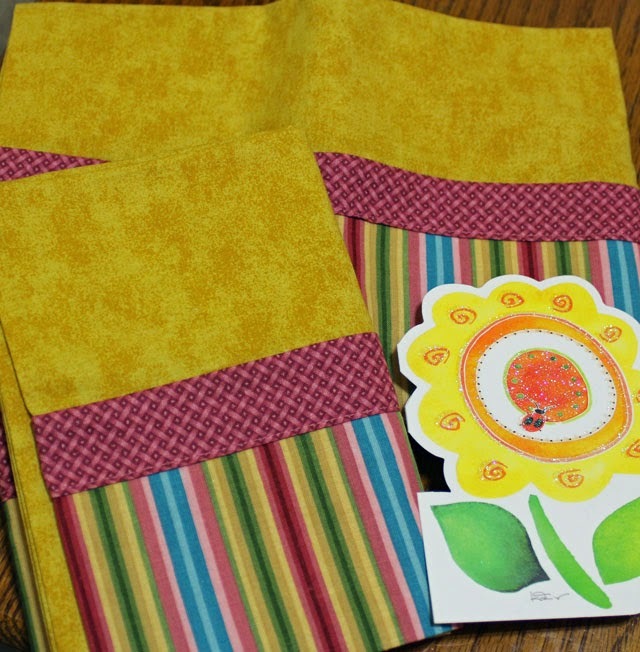 Received a happy mail package from my sister Brenda with two beautiful pillowcases that totally brightened my day . . .
and look wonderful on our bed! Thanks Brenda! 2. Sandy's tutorial for decorative paper clips was the INSPIRATION for creating and adding a decorative paper clip to my INSPIRATION binder. Of course, I made a few extras, too! 4. After a relatively mild winter, the final week of February and first week of March were terribly disappointing as we had several days of ice and snow! Fortunately, the temperatures continue to rise each day and we are enjoying sunshine and spring rains as we prepare for our upcoming trips. Has spring arrived at your place yet? 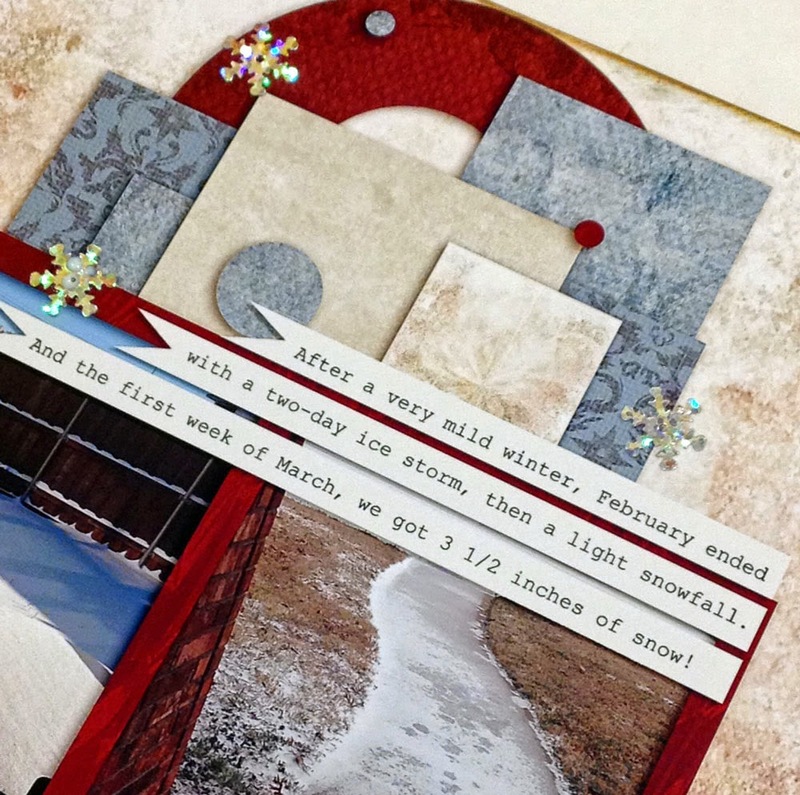 After seeing Susanne's January counterfeit kit, I decided to try to create a scrapbooking kit based on the challenge over at the Counterfeit Kit Challenge blog. Here's a look at the INSPIRATION for the kit. 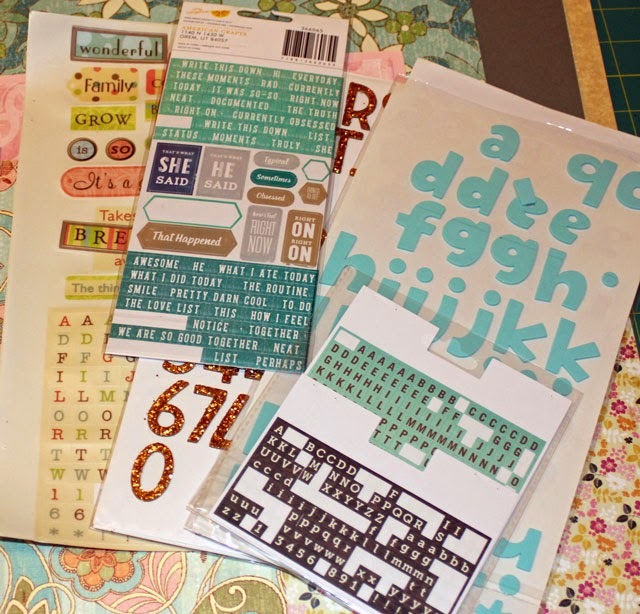 I put together my own kit with papers, pocket cards, letter stickers & thickers, washi tape, and miscellaneous embellishments. Somehow I didn't get a photo of the entire kit, but here's a look at the various components. I added in some tans/browns, so I'm not sure that I did a great job capturing the feel of the kit used for INSPIRATION. I pulled several groups of photos to use with this kit and ended up creating three layouts over the past several weeks. 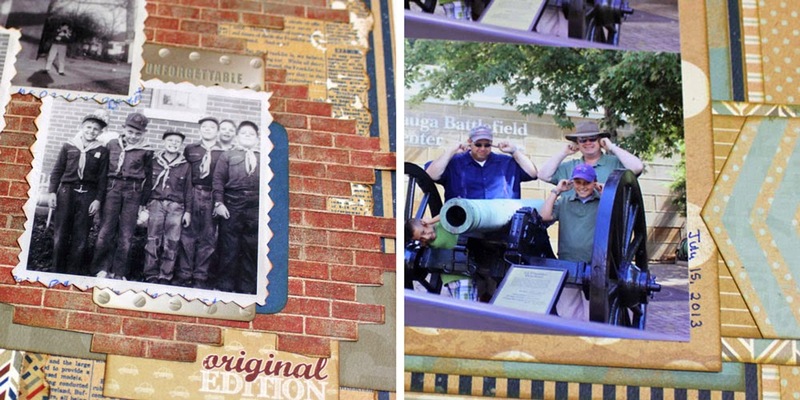 The first of these showcases a single photo from our visit to the Frontiers of Flight museum back in 2011. I've scrapped several photos from that visit, but this one deserved its own layout. 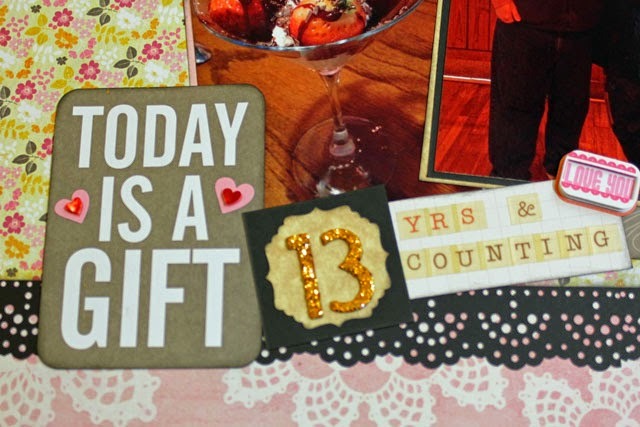 The next layout showcases photos from this past December as we celebrated our 13th wedding anniversary. 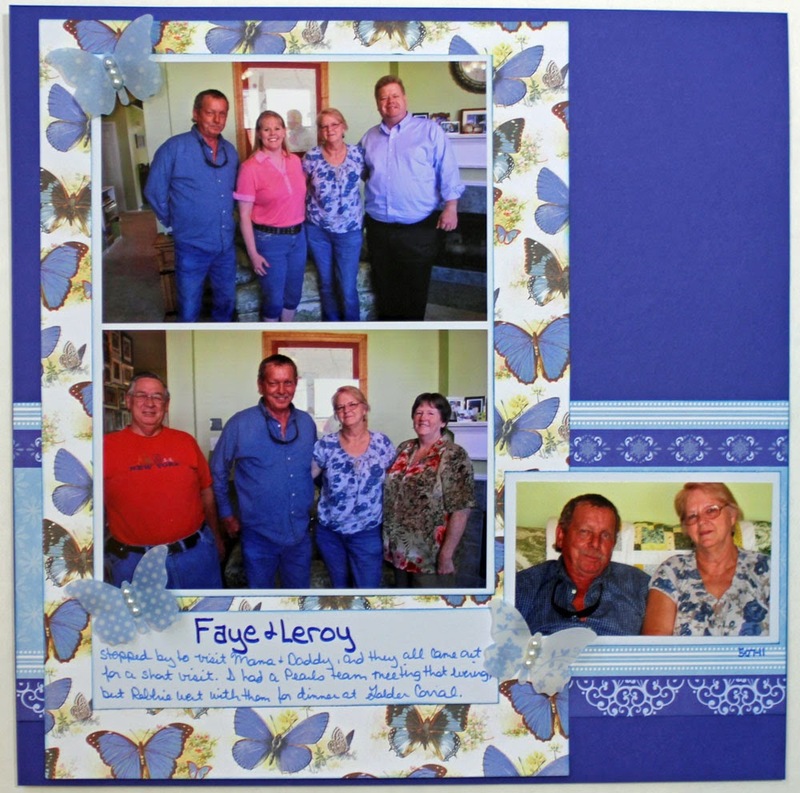 I actually created this at Scrapbook Expo and was able to punch that black border strip at the Tool Station set up in the crop area. 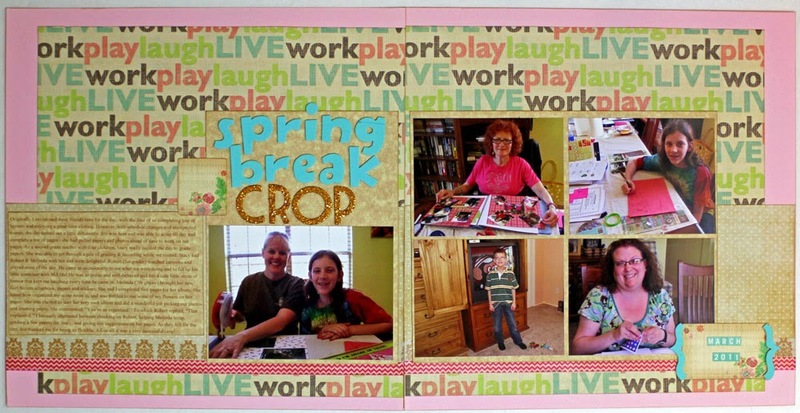 The last layout is a two page spread with photos and a large block of typed journaling about my 2011 spring break crop. I had quite a bit of the kit left over but wasn't feeling inspired by it any longer, so I incorporated the remaining items back into my stash. I enjoyed the challenge and am thrilled to have three more memories preserved! Do you create your own kits? 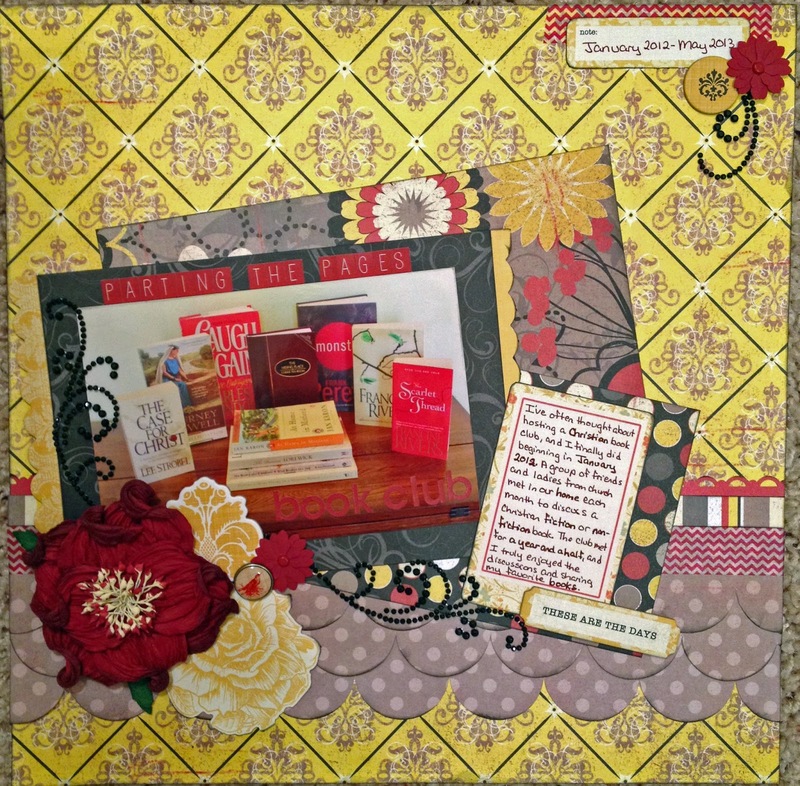 Do you use other kits as INSPIRATION or simply put products together yourself? 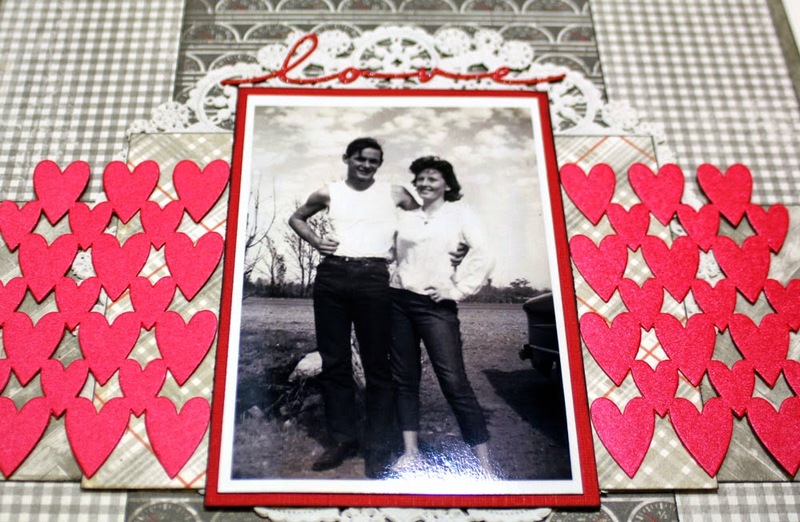 While this paper line has a decidedly masculine feel, I was also able to use the grays to create a "softer" feeling layout showcasing a photo of my parents when they were dating or just newly married. 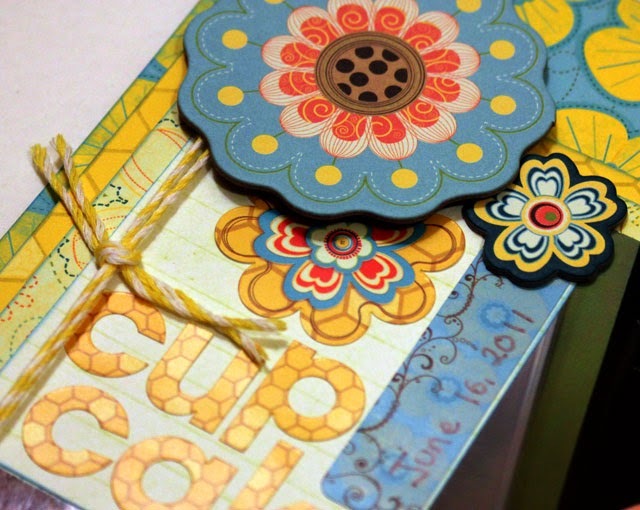 Have you used any Authentique papers lately? Do you have a favorite collection? 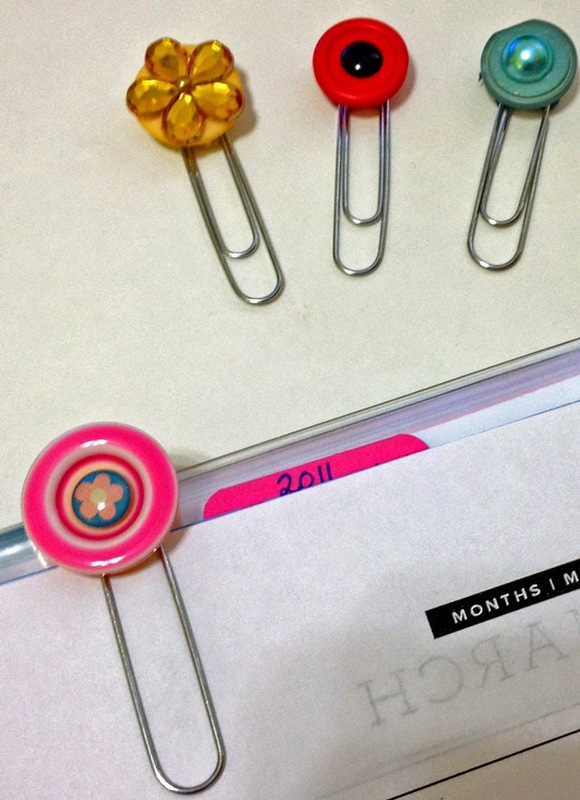 As part of my year of INSPIRATION, each month I am challenging myself to scrap my Top Five (photos or stories or events) from the previous month. I actually created the first of my February layouts before the month ended rather than put these pieces of memorabilia into my to-scrap file. 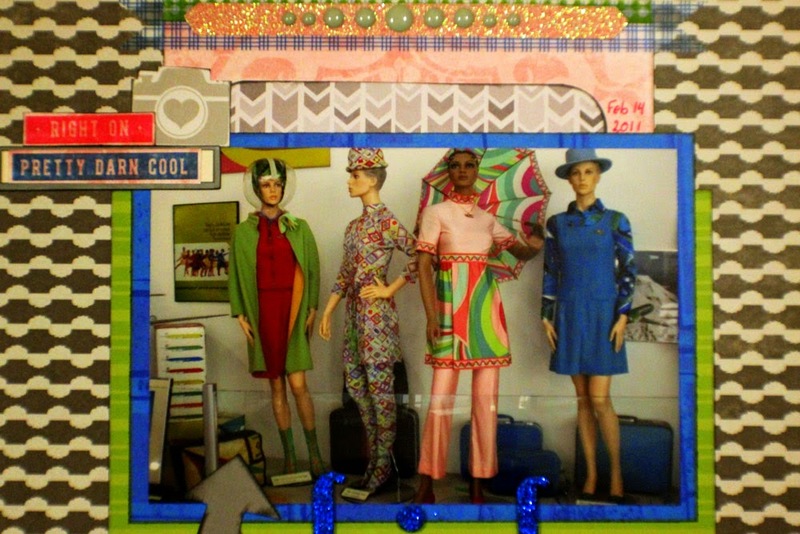 One of the FUN activities at Scrapbook Expo is collecting buttons to wear or pin on a scrapbooking tote. For example, by taking a class at the Expo, you receive a button that reads "I Learned." For attending one of the crops, you receive one that reads "I Cropped." If you collect at least four buttons, you can then get the special medallion that reads "I Conquered Scrapbook Expo." Over the course of the two days I was at the Expo, I collected five buttons and the medallion, along with a nice lanyard. Some of you may recognize the "Be Inspired" button as I added it to the front of my INSPIRATION notebook. I hung the lanyard in my craft room, then added the remaining buttons and medallion to a layout. I cut out the section about collecting the buttons from the show guide and used it as the journaling on my page along with a photo of me with all those buttons pinned on my jacket. I really like how the final layout looks and am excited to have these FUN pieces of memorabilia preserved in our 2015 scrapbook! Would you have used those buttons on a layout? Or displayed them in another way? I'm enjoying working on layouts for our 2011 chronological albums, remembering and preserving the stories of our life from that year. I know that some scrappers complain about scrapping the same things year after year, but it doesn't bother me at all! Even though I have a layout from a previous year showcasing photos of the twins baking, I had so much FUN putting together this one showing how intently they are icing the cupcakes. 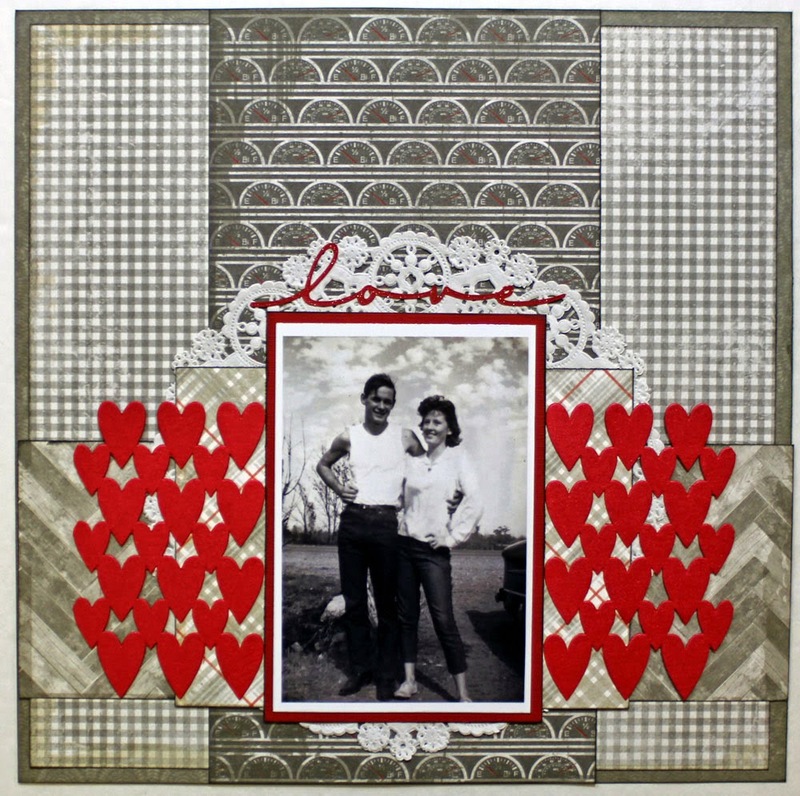 I also enjoyed using stickers and chipboard pieces to add dimensional cluster embellishments on this layout. And even though I just documented our most recent visit with my nephew, I enjoyed putting these photos from a previous visit together. 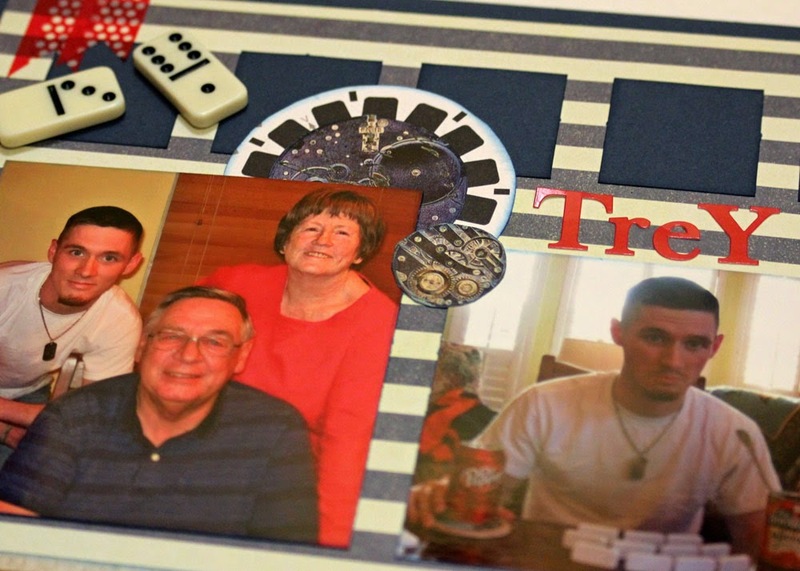 My friend Amy recently gave me these great domino embellishments that worked perfectly with these photos! And despite the fact that Easter occurs every year, I love the design of our 2011 page. 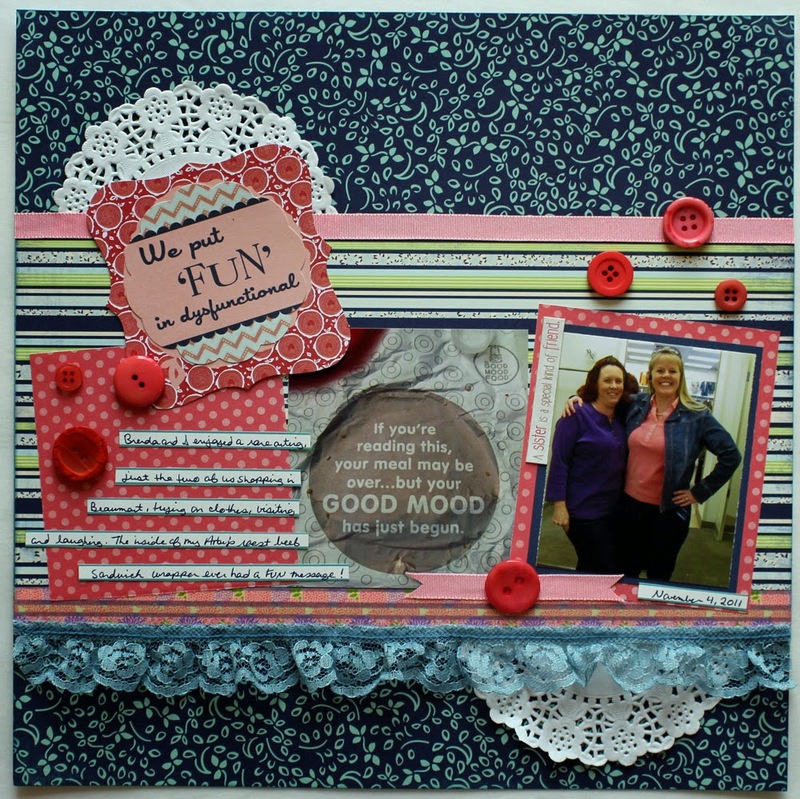 The INSPIRATION for this layout came from a layout in the old BPC Creative Crop 2011 classroom. I created the large doily with the new Martha Stewart circle edge punch Robbie got me for Christmas and combined lots of new and old products to create the borders and embellishment clusters. What about you? Do you enjoy scrapping similar events and photos from year to year, or do you dread having to scrap yet another layout with the same theme?